“I love the look and feel of white everywhere with dark-stained floors,” Vida Mylson says of her kitchen’s classic Shaker-style cabinets, polished quartz countertops and shimmery mosaic marble backsplash. Gothic-inspired mullions add visual relief—and style—to lighted glass-front cabinets. Comfort is many things: where you choose to lay down roots or raise your family, how convenient the interior space is for everyday living and entertaining, or the balance of color and form that’s soothing to the eye. For homeowners Vida Mylson and husband Eric Weiner it was a return after many years to Bergen County, New Jersey where they grew up—she in Montvale, NJ, he in Woodcliff Lake, NJ—that led to their happy place: a newly built home in nearby Upper Saddle River, New Jersey. Mylson says the move felt “like a natural progression” for the family of six, which includes three children and her mother. Rustic wood finishes and sleek industrial accents play up the mix of casual and refined. Whimsical glass bubbles hang from the elliptical chandelier’s wrought iron frame. “When we thought about the house and functionality,” she says, “I wanted it as clean and classic as possible…[something] we could grow with” and not consider outdated or overdone in five years. In the walk-through butler’s pantry, Pacca reintroduced the same door style as in the kitchen but with a dark ebony finish to “dress it up” so it flows well into a more formal dining room (not pictured), she says. The countertop is quartz and the backsplash tiles are Carrera marble in a herringbone pattern. For a clean, integrated feel, wood panels conceal most of the appliances, while two lighted glass-front cabinets with Gothic-style mullions provide visual relief. With two sinks, two dishwashers, four ovens and “an awesome pantry,” the kitchen is very functional for multiple cooks, says Mylson, who entertains large groups frequently. Furnishings reflect a twist on tradition with clean lines and modernized damask patterns. 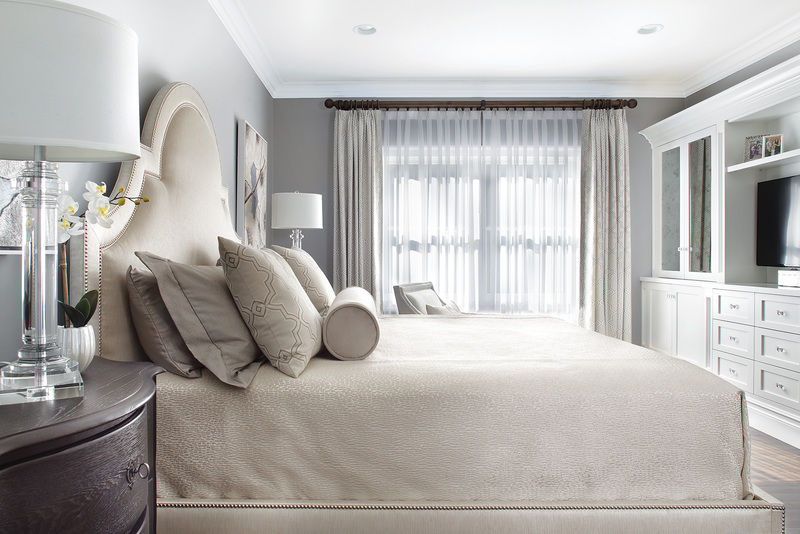 Keeping the foundation neutral in shades of gray, white and ivory allows the homeowner to add pops of color in other accents and accessories. Custom bar stools at the island—covered in gray vinyl with a metallic sheen—can be wiped clean easily with a sponge or cloth. Polished quartz countertops are equally fuss-free and family friendly. “I would have gone with Carrera marble,” Mylson says, “but we drink red wine and didn’t want to worry about stains or ring marks.” Quartz, she reasoned was a good compromise. “I love quartz and have it throughout the house,” she says. “It looks amazing at all times and is extremely functional for a family.” Pacca agrees. Chrome pendants above the kitchen island are sweet reminders of Eric Weiner’s childhood home. “We were high school sweethearts” and these lights were central focal points above his family’s pool table, Mylson recalls. As Pacca tells it, “Vida had her heart set on using those” lights and the idea of bringing that sense of nostalgia into their own family home. In the open layout, only columns separate the kitchen from the main living area, which “feels like one huge room,” Mylson says. A custom, button-tufted gray chenille sectional—accented with chrome nail heads—pairs with chairs upholstered in a large-scale damask print, adding an updated take on tradition. The clean and classic backdrop of gray, white and ivory allows for pops of color in other accents or accessories should Mylson want to make adjustments from time to time. “I wanted to draw the eye upward and capture the drama of the two-story great room,” interior designer Jennifer Pacca says. She designed a built-in wall unit that features high-contrast black X-front glass frames. The chandelier “brings down the scale and adds the warmth of wood to the space,” she adds. Like what you’re reading? Subscribe to Design NJ today! “White against black is always good for drama,” says Pacca, who kicked it up a notch in the powder room’s tone-on-tone damask wallpaper and reflective glass-front vanity with decorative mullions. The iconic combo of black and white is heightened also in the powder room with chic tone-on-tone black damask wallpaper juxtaposed against a crisp white vanity, which mirrors the decorative glass-fronts in the kitchen. “The floor is a basket weave of white and black marble that ties everything together,” Pacca says. Other repeating design elements complement the whole, such as in the butler’s pantry, which incorporates the same door style as the kitchen but with an ebony stain to “dress it up” so it flows into the adjacent, more formal dining room. “The idea of a mudroom is fantastic, but exposure to everything not so pretty,” homeowner Vida Mylson says. 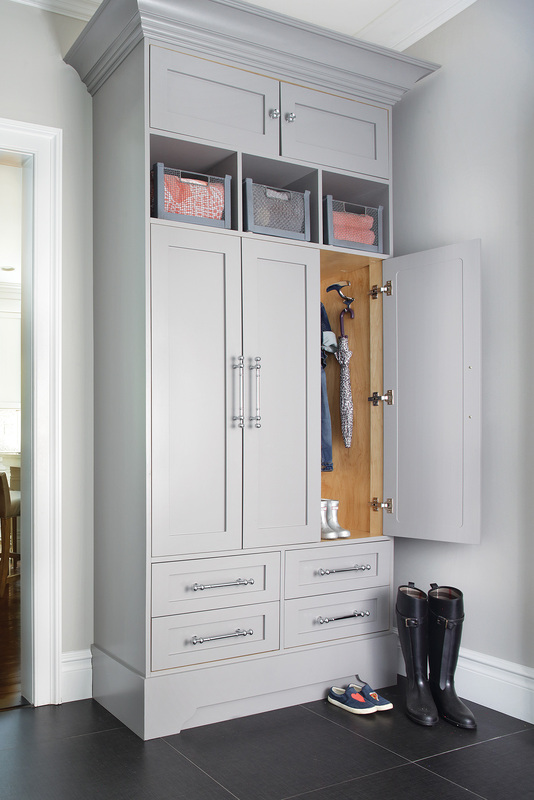 Painted gray, this custom built-in keeps the kids’ belongings organized and out of sight. Open bins are reserved for towels to clean up the occasional muddy paws from the family Westie. The mudroom’s efficient gray-painted built-in keeps all the kids’ coats, shoes and other gear easily accessible but out of sight. Storage and style are optimized also in the grandmother’s bedroom suite. Antiqued mirrored doors lend depth and distinction to a wall of custom cabinetry, while a neutral color scheme and limited patterns—but a mix of textures in silk, linen and chenille—contribute to the warm and peaceful setting. “I love walking into this room…it’s one of my favorite spaces,” Mylson says of her mother’s bedroom. “It was the first room we designed” upon moving into the home, not long after her father’s passing, she says. Overall: interior design, Jennifer Pacca Interiors in Hillsdale; builder, Chiellini Construction Co. Inc. in Park Ridge. Kitchen: cabinetry, Kitchen Concepts in Norwood; Thermador appliances, Karl’s Appliance in Paramus; quartz countertop, Viatera Minuet by LG; marble mosaic backsplash, Artistic Tile in Paramus; stools, Vanguard. Breakfast Room: table and chairs, Restoration Hardware; chandelier, Balthazar by Currey & Co. Butler’s Pantry: quartz countertop, Viatera Minuet; marble backsplash, Artistic Tile. Great Room: built-ins, Rafael Designs in Rochelle Park; custom sofa, Vanguard; chairs, Bernhardt; cocktail table, Orient Express Furniture in Foothill Ranch, California; area rug, Jaunty Co. Inc. in Los Angeles; wall paint, “Balboa Mist” by Benjamin Moore. Mudroom: built-in, Rafael Designs; porcelain tile flooring, Creative Stone Works in Park Ridge. Powder Room: vanity, Kitchen Concepts; quartz countertop, Via­tera Minuet; marble flooring, Creative Stone Works; mirror, Uttermost; light fixture, Elk Group International in Nesquehoning, Pennsylvania. Grandmother’s Bedroom: bed, side table and chair, Bernhardt; lamps, Currey & Co.; built-in storage, Rafael Designs; drapes, Valcamy Window Treatment LLC in Lodi; wall paint, “Nimbus” by Benjamin Moore. 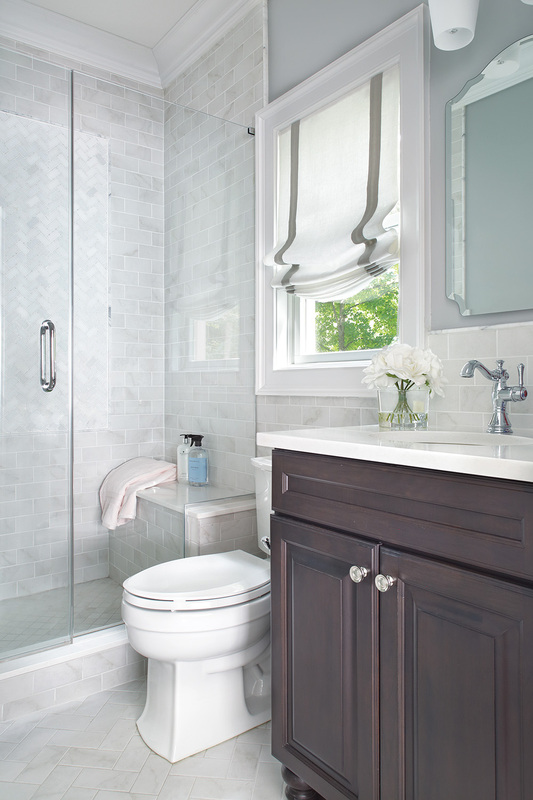 En Suite Bathroom: vanity, Kitchen Concepts; countertop, white Caesarstone; tile, Creative Stone Works; Roman shades, Valcamy Window Treatment LLC.